Enjoy a great location in the heart of Columbia*s lively cultural and shopping hub *The District * when you stay at The Broadway Columbia - a DoubleTree by Hilton Hotel. Appreciate the hotel*s modern facilities and the warm welcome and chocolate chip cookie you receive upon arrival. Our stylish hotel offers easy access to the restaurants theaters shops and bars of downtown Columbia and is within walking distance of the University of Missouri Stephens College and Columbia College. 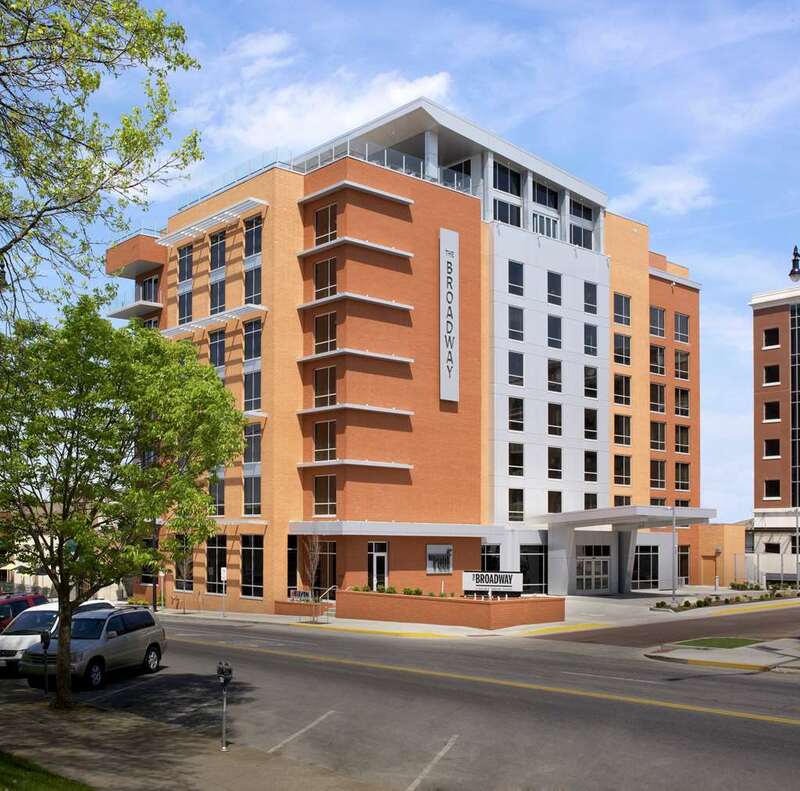 Enjoy views of downtown Columbia and soak up the lively atmosphere of the arts district from the comfort of your spacious LEED/tm/ Green Certified guest room. Feel at home with amenities including plush Sweet Dreams beds Egyptian bedding an HDTV a walk-in shower and complimentary WiFi. Ideal for families or longer stays our downtown Columbia hotel also offers luxurious suites which feature a separate living area and kitchen and impressive wraparound balconies. This centrally located hotel in Columbia MO is the ideal venue for a business or social event with 3000 sq.ft. meeting space including a flexible ballroom and the latest A/V technology. Print documents in the 24-hour business center and enjoy complimentary WiFi in the hotel*s public areas. Work out with the latest equipment in the complimentary 24-hour fitness center before recharging with a coffee in the relaxed Lobby Bar. Enjoy American cuisine in Eleven/Eleven before meeting with friends to sip cocktails by the outdoor fire pits in our impressive Rooftop Bar. Eleven/Eleven: Eleven.Eleven features an amazing culinary experience for breakfast lunch and dinner.